Fine Decorative Wooden Tokari Available In Different Designs & Sizes. Item Size: H-4.5", L-11.5", W-17"
Dim Sim Baskets Made Of Spl. Wood For Serving Momos E.t.c. Dim Sim Baskets are made in so many sizes and manufatured from best quality natural wood . Used in modern hotels, Restaurants, and cafeterias. Spl used to serve Momos. 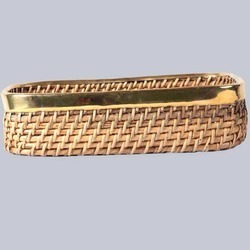 Straight Basket is made available in different specification to reach utmost clients satisfaction. This basket is perfectly designed using premium grade material. We offer our clients a wide range of Bone Inlay Wooden Basket which creates an example of incomparable beauty. We welcome our customers to give us their designs and preferences, and we assure that the end-product will stand at par with their expectations.